Velasquez left so many games before the 6th inning when his stuff was excellent. for heaters thrown in two strike counts. was emerging as his favorite. straightest pitch with such frequency when in the most advantageous spots because it’s the easiest to follow. pitches. Of pitchers who threw at least 2,000 pitches, that percentage is neither high nor low. thrown in all possible two strike counts in a table below. 380 of his 428 two strike fastballs were four-seamers. That’s an astounding 88.8% of those pitches. And if he was ahead in the count, there was a 90.5% chance the next fastball would be a four-seamer. It’s not just that breaking pitches would have likely missed more bats, but that Velasquez made it easiest on hitters when it should have been hardest. Let’s check out what happened on all those four-seamers. The pie chart below (mmm, pie) shows the result from each. Specifically, focus on the orange and blue. 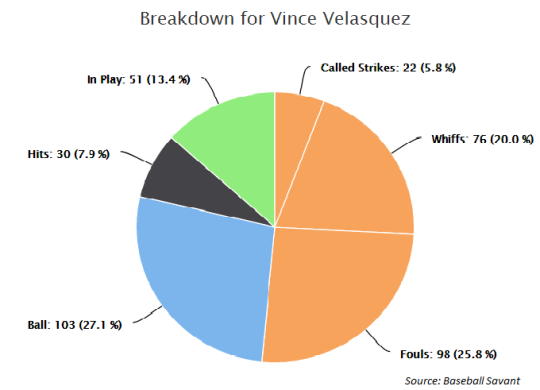 Yes, Velasquez got the third strike nearly 26% of the time when he threw a four-seamer in a two strike count. But between balls and foul tips there was more than a 2:1 chance he would have to throw another pitch in just that at bat. Those aren’t odds you want to take when trying to put hitters away. Velasquez was clearly confident throwing the heat in 2016 but in the scope of his whole approach it seems to indicate a lack of awareness. A 24 year old lacking awareness isn’t necessarily worth sweating but this information shows where a major ache in his game was. Whether or not he’s near the top of the league in fastball percentage, being more situationally mindful could make Velasquez a bigger difference maker in 2017.